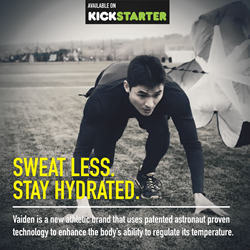 Vaiden, a new athletic brand developing advanced athletic apparel, recently launched a campaign on the popular crowd-funding website Kickstarter.com. The venture utilizes patented technology originally developed for astronauts to help regulate their temperatures while in orbit. Campaign visible at: Vaiden Kickstarter Page. “This is a high-performance technology that we thought would have a great application in sports,” states James Chung, C.E.O. of Vaiden. The technology, Phase Change Materials, stores excess heat in polymer shells within the fabric that is later released back to the athlete when it is needed most. Aiding in the regulation of skin temperature, the apparel reduces sweating, which may help the wearer to stay hydrated longer and conserve metabolic energy otherwise exhausted through perspiration. Vaiden is offering their products at direct-to-consumer pricing, finally bringing this cutting-edge astronaut technology to every day consumers at accessible pricing. Vaiden is a startup that is developing a tech-driven athletic brand. The Nova Gear Collection is an extension of its core mission to merge innovative technologies with sports to enhance the athletic experience.